Acupuncture is an ancient Chinese practice based on the principle that health is determined by chi, the vital life energy that flows through every living thing. This energy is thought to move through the body along pathways called meridians, each of which is linked to a specific organ. If the flow of energy is balanced, the individual enjoys good health. If something interrupts this flow, various problems including pain can result. Acupuncture is used to restore proper energy flow and good health. 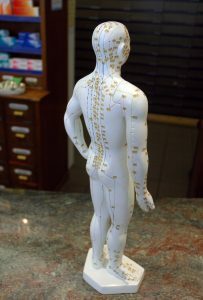 In acupuncture treatment, Dr. Nance inserts thin needles at specific points in the body. Although very slight discomfort may occasionally be felt upon the insertion of the needle, the treatment is virtually painless. The needles may be left in place for anywhere from a few minutes to a half-hour. Relief may be experienced after only one treatment or after a series of treatments. To support the acupuncture therapy, Dr. Nance may recommend taking herbs in the form of teas or capsules, and may also suggest specific lifestyle changes and exercises. Acupuncture is most commonly used to relieve pain, including backaches and migraine headaches. Studies have shown that acupuncture may stimulate the production of endorphins, the body’s own painkillers. Completely safe, acupuncture has no known side effects. Afraid of needles? Try acupressure instead.